While the theme of our next event is not yet decided, we are accepting speaker applications at this time. Your talk proposal should address ideas that are relevant to local audiences, yet also appeal to the global TED and TEDx audience. Watch lots of TED and TEDx talks to become familiar with the format. We are looking for idea-centered talks, not motivational speeches, personal histories or sales pitches. Make sure your talk idea fits within the theme of our event. We are looking for a broad range of topics and ideas, but your talk should connect in some way with the overall focus of the event. You don’t have to be THE expert on the topic you want to discuss, but you should be AN expert – or at least have some relevant experience or personal connection to the idea. Ready To Submit Your Talk Idea? 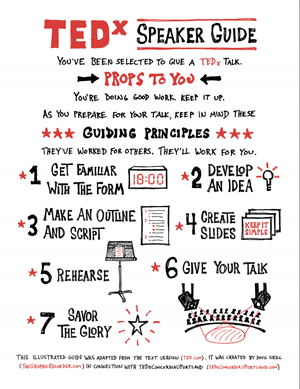 is an especially helpful resource for planning your talk. We recommend reviewing it before submitting your talk idea. What are your credentials for speaking about this topic? Briefly describe your speaking experience. Include video links if you have them.